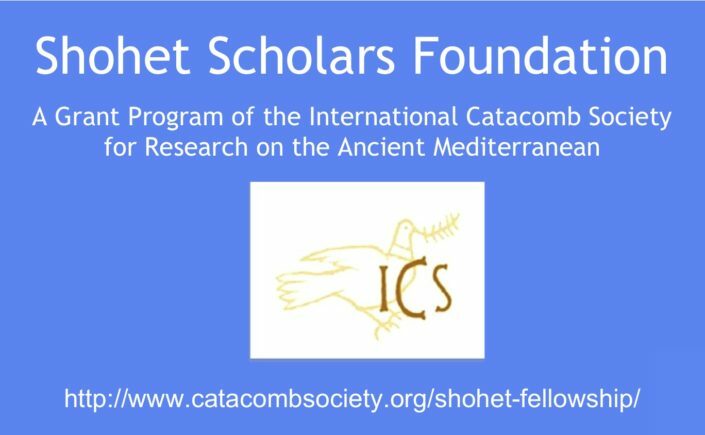 The Shohet Scholars Grant Program of the International Catacomb Society is now accepting applications to the Shohet Scholars cohort of 2018-2019. Submission deadline is January 15, 2018. This annual grant program funds research on the Ancient Mediterranean from the Hellenistic Era to the Early Middle Ages. Shohet Scholars may do their research in the fields of archeology, art history, classical studies, history, comparative religions, or related subjects. Of special interest are interdisciplinary projects that approach traditional topics from new perspectives. One or more Shohet Scholars will be selected each year. The primary intent of the grant is to support significant, innovative research that can be completed and reported upon within and shortly after the award period. Grants may be made to seed innovative approaches and new ideas or to cover specific expenses or phases of a larger project under the direction of the applicant. At this time, awards in the range of $2,000 to $30,000 will be made. The Shohet Scholars Program reserves the right not to make a grant in a year in which there are no applications meeting the requirements of the program. A complete history of past and present Shohet Scholars awards is available on the ICS webpage, www.catacombsociety.org. Scholars of all institutional affiliations and independent scholars may apply for Shohet Scholar funding if they are individual or institutional members of the ICS at the time of the application submission deadline of January 15, 2018 and in possession of a doctoral degree or the equivalent. Preference will be given to applicants in the early postdoctoral or launching stage of their careers (i.e., persons awarded the doctorate within six years prior to the application deadline). Non-U.S. citizens may apply if a co-applicant is a legal resident or native or naturalized citizen of the U.S.A., meets all eligibility requirements, and has a genuinely collaborative and credited leadership role in the proposal. Co-applicants must submit as individuals all the necessary forms except for the research proposal, list of permissions, and budget proposal, which may be filed jointly. Employees, contractors, and members of the Board of Directors or Advisory Board of the ICS and their families are ineligible. No applicant will be denied consideration or selection because of race, religion, or ethnic origin. Any fraudulent misrepresentation of self and information about a proposal will result in a disqualification. Shohet Scholar grant recipients are expected to: 1. acknowledge the Shohet Scholars Program of the International Catacomb Society in all publications and activities that are funded in part or in whole with the award with direct notification to the Society when these events occur and 2. provide the Shohet Scholarship Committee no later than three months after the end of the fellowship year with a brief, illustrated report of the work carried out or in course, suitable for publication on the ICS website. The application deadline for the 2018-2019 academic year is January 15, 2018. The award announcement for the 2018-2019 academic year will be made by May 1, 2018, for funding to be disbursed on July 1, 2018. Please note: starting in 2018, all funding is awarded directly to the USA-based awardee, for distribution among project co-applicants and collaborators. The ICS will no longer wire or transfer money to bank accounts outside of the USA. Click here for application forms and instructions and here for assistance. If you have any questions about the suitability of proposed projects, application procedures, or any other matters related to the Shohet Scholars Program, please consult our FAQ page or contact us at shohetscholars@catacombsociety.org.